London with teenagers. What's going to impress them? We've been to the UK's capital city with the kids a few times now and ticked the main touristy bits off the list. London Eye, Tower of London, Buckingham Palace, Open Top Bus Tour, London Bridge and so on. Now at 13 and 15 what was going to impress? Adrenalin and Heights! You may already have read about our trip down and back on the Caledonian Sleeper. Not sure the height of the bunk bed and the adrenalin of the bumps over the tracks count, but do give our review of Aberdeen to London on the Caledonian Sleeper a read. 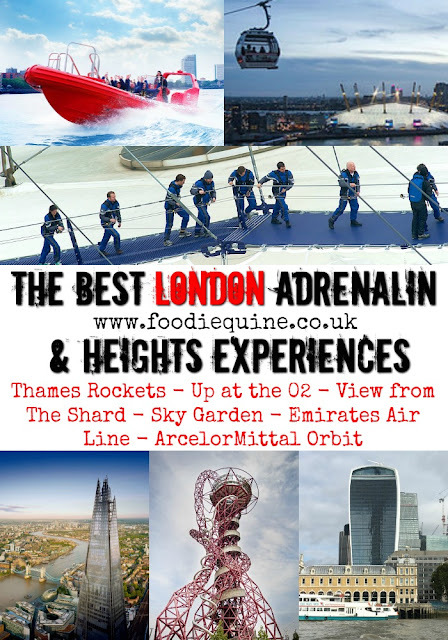 For the real deal on the best adrenalin and heights London experiences here's what we tried out during out time in the big smoke. There's a reason that Thames Rockets are #1 in their category on Trip Advisor. They provide an absolutely amazing experience that combines sightseeing, speed, thrills and music. This is the first thing we headed to following disembarkation from the sleeper train and a hearty breakfast in Borough Market. Priced at £39.50 per adult (when booked online in advance) the Thames Rocket rib boats depart from the London Eye Pier right next to, you've guessed it, The London Eye. The weather was fab for our Ultimate London Adventure trip but if it's inclement they have waterproofs and goggles for you to wear alongside your lifejackets. The trip lasts for 50 minutes and to start with is rather sedate. We had skipper Andy at the helm and tour guide Joseph giving us an informative and humourous rundown of the sights pitched at just the right level for all ages - even the teenagers were enthralled! You really do get a different perspective of the city from the water but this whistle stop tour was only the warm up act. Once under Tower Bridge it’s time to tighten your grip as the engine revs, the speed whooshes up to 35mph and the sound system kicks in. AMAZING song choices which only added to the experience (lots of which I sing at Rock Choir so I was most definitely singing along) The twists and turns make it a thrilling white knuckle ride through the docklands whilst pretending you are James Bond. This is an absolute London must do, which I would happily do again and wholeheartedly recommend. My son reckoned that those that we sped past on more sedate river cruises were green with envy. On the trip back down the slower part of the river Joseph went round everyone on the boat finding out where they came from, the purpose of their visit and offering to take photos. Such great customer service really does make a difference. We disembarked feeling totally pumped with wide smiles and dishevelled hair. A trip to the top of The Shard (Western Europe’s tallest building) is something that I've wanted to do for a long time. It's become such an iconic building on the modern London Skyline, however a trip to the top doesn't come cheap. Standard price for an Adult is currently £30.95 so keep your eyes peeled for deals. With a pre booked time slot we were whisked quickly to the top and London’s highest viewing gallery via two lifts. Once up there, there's really not much to do apart from admire the views and enjoy a drink. We were lucky to get a clear and bright day so could see all the sights and also made use of the interactive Tell:scopes. A glass of Champagne was a must for the obligatory selfie and Instagram worthy capture. There were a couple of Virtual Reality experiences available which my son paid extra to participate in (£10 each or both for £15) I'm unsure if these are a permanent fixture or not. His verdict was a big thumbs up for The Slide but don't bother with Vertigo. We had to wait quite a while until his turn and to be honest we wouldn't have hung around so long otherwise. There's no time restriction once you're up but you'll have seen it all in 30 minutes. It's worth noting that restaurants at The Shard are entirely separate, they are located halfway down with no access to The View from The Shard. I'm glad to have ticked it off my list but it's not something I'd particularly rush to do again. However I do quite fancy spending a night there after reading my blogging colleague Helen's review of Shangri-La Hotel at The Shard. Created by Anish Kapoor and Cecil Balmond the magnificent looping structure of the ArcelorMittal Orbit is an iconic symbol of the London 2012 Games. Located in the Queen Elizabeth Olympic Park it was home to the BBC Sport Studio. It's the UK’s tallest sculpture and home to the world’s longest, fastest, tallest tunnel slide. Pretty much a giant red metal helter skelter. An adult combo entry and 'Ride The Slide' ticket costs £16.50 (when booked in advance online). It's located in Stratford right next door to the enormous Westfield shopping centre. Alas my teens aren't shoppers but we enjoyed lunch in the food court. On arrival the kids were keen to get on the slide as quickly as possible. Be aware that you need to leave all possessions in a locker at the base of the sculpture including phones/cameras/go-pros. Before sliding you are kitted out with head and wrist/elbow protection and you slide down in a giant body bag. The actual ride is really thrilling with plenty of twists and turns and was much, much longer than I expected it to be. We all really enjoyed it. The kids were absolutely desperate for a second go but tickets only include one ride. After collecting our belongings we travelled up to the top viewing platform. Rather disappointingly there's nothing at the top apart from the views and for us it wouldn't have been worth visiting if it wasn't for the slide element. Rather than take the lift back down we opted for the 455 stairs with their specially designed soundscape soundtrack of London. I'd absolutely recommend this method of descent as I found it fascinating. The Queen Elizabeth Olympic Park itself is well worth exploring. We hired 'Boris Bikes' for this - best bargain of our visit! I LOVE a cable car and no matter where we are in the world if I spot one I want to travel in it. The Emirates Air Line is actually part of the Transport For London system but I suspect it is used much more by tourists than by commuters. It worked really well for us to travel one way between Royal Victoria Docks and Greenwich Peninsula. A single adult ticket is £3.50 (when booked online in advance) or you can use Oyster pay as you go. We were lucky to get a car to ourselves so plenty room to move around, admire the views and take photos. Commentary would have been good to add some context to the sights. Worth doing if you can tie in as a method of travel but possibly not as a stand alone experience. I never made it to the Millennium Dome in 2000 and until climbing over it I'd never even visited. A few weeks before our climb I was flying home from London City Airport and from the plane spotted a group of people climbing over the top. Eek! That was soon to be us. The original climb costs £30 per person for a 90 minute experience. You are kitted out with everything you need including boots. Personal possessions are left behind and get transported to the finish point. You can bring a phone or compact camera which gets zipped into a pocket and can only be used on the top viewing platform. Once kitted up with harnesses etc we made our way to the start of the climb with our instructor Victoria. She talked us through all the safety procedures and explained how all the equipment worked, time for some officiial photos and we were on our way. You are climbing on a 380m long fabric walkway suspended 2m above the surface of The O2 roof, 52m above ground level. To mirror the surface of the tent there is a slight bounce underfoot with an incline of 28° on the way up and 30° on the way back down. You are clipped on via your harness at all times. It really is a challenge to complete although you get slicker with the equipment as the climb progresses. At the summit, there is an observation platform where you spend 20 minutes and can take in spectacular views of London and get your phones and cameras out. The climb down is even steeper with some finding it easier to descent backwards. Up at the O2 was a great challenge to undertake and something really different to do on a city break. The views from the top are very different from those from The Shard and Sky Garden as you are adjacent to a different part of the Thames. We were really pleased with our official photos and purchased them in the gift shop - something we very seldom do. I'd love to do this again for a sunset or twilight climb. Was also interested to hear that they offer accessible climbs for wheelchair users which sounded like an amazing experience for all involved with a specialist wheelchair and four guides using a pulley system to assist. FAB-U-LOS was the verdict from the teens for this and it was their favourite of all the experiences we undertook. The big plus point for the capital’s highest public garden is that it's free to visit. However, you do need to book ahead to get a time slot which become available 2-3 weeks in advance. It was only when we actually got to London that I realised that the Sky Garden is in the building better known as the Walkie Talkie. Despite the booking system, there was quite a large queue to get in but it moved relatively quickly. Unlike The Shard the restaurants at Sky Garden are on the same level as the viewing area and if you have a restaurant booking you can skip the main queue. Again once you are up at the top there are no restrictions on how long you can stay. The actual space is much, much larger than the Shard and you have 360° views. Unfortunately for this we weren't lucky with the weather and because of this the outside area was closed. At the top you have plants, restaurants, cafe, bars but strangely no gift shop! Definitely worth a visit as a free alternative to The Shard. The Unlimited Brunch at Darwin Brasserie as reviewed by my blogging collegue Emma sounds like a tempting reason to return. Disclosure: We experienced Up at the O2, The Slide at the ArcelorMittalOrbit and Thames Rockets as guests. All other experiences and extras were at our own cost. Neither of my teens are into shopping or just wandering about so it was ideal to have all these adventures lined up. Looks like you had a fabulous time. Entertaining two teenagers on holiday is not an easy task, I remember it well! You certainly kept them occupied and those big smiles say it all. We did so much more than I've shared here! A couple of West End Shows, tour of The Globe theatre and a visit to Madame Tussauds. Not to mention all the food we ate - but that's for another post! Good for your Nanna! I hope I'm still seeking thrills at the age of 82. We are all SO bad at not doing the things on our own doorsteps. Hope you can tick some of these off soon. Ah yes pregnancy may not be great for them all but do try Sky Garden and the Emirates Airline as they are high but relatively tame. The Orbital Slide was SUCH fun - if you like that kind of thing! Great to have another recomendation for Darwin's Brasserie. Definately on my to do list for next time. Would love to eat and stay in one of the shard resturants/hotel too. What a fantastic selection of activities, really love the sound of all of them and I love that you focused on adrenalin rush London, what a great theme for choosing what to see and do. I really fancy the faster Thames cruise and the orbital slide and cable car as well! Isn't it great how London tries to come up with these fun things to do in the capital whilst showcasing the view?